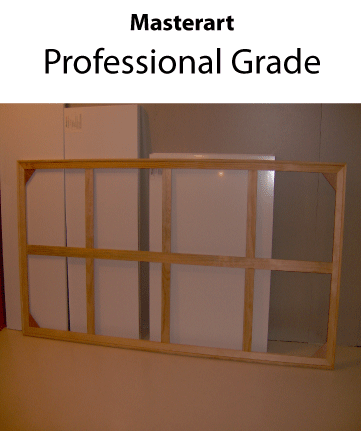 Masterart Professional grade artists canvases are used all over New Zealand, and the Pacific region by artists looking for durability and strength. Made with our own 32 mm deep interlocking stretcher bars and the highest quality 12 oz pre-primed canvas, Masterart Professional canvases will suit most applications. Masterart proudly produces some of the best artists grade canvases in New Zealand. Years of research, testing of materials, applying different methods of assembly and stretching of canvases means that the canvas that you buy from Tanji's Art Supplies will endure well in to the future. Made with our pre-primed, ready to use Polyester / Cotton blended canvas are ideal for all art works, big or small. Made with our Heavy Duty, 32 mm deep kiln dried, radiata pine interlocking stretcher bars that are made right in Tauranga factory, Masterart canvases are suitable for oils, acrylic and mixed media artists.